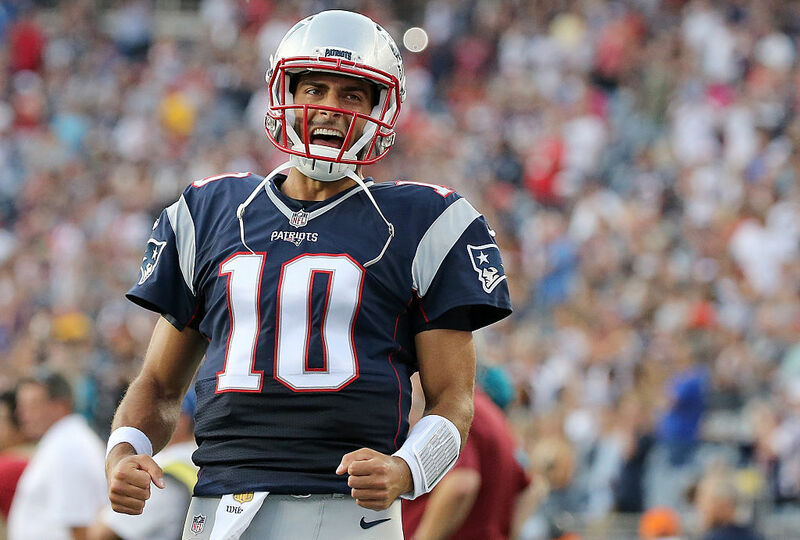 Can Jimmy Garoppolo Continue To Exceed Expectations Against The Dolphins? When Jimmy Garappolo overthrew a wide open Danny Amendola on his first play of the game last Sunday night, I thought we might be in for a long four weeks to start the season. As it turns out, that was actually his worst throw of the game. The kid was impressive. There’s no two ways about it. He looked completely calm and composed on his way to completing 24 passes on 33 attempts for 264 yards. I might even say he was reminiscent of a young Tom Brady in 2001. I recognize that’s a complete overreaction but if we’re just using his first game as a sample size then it’s accurate. He was that good. He’s also the exact same age that Brady was when he stepped in for Drew Bledsoe in that memorable week two against the Jets 15 years ago. The question is whether or not this 24 year-old can continue his success past one week, but beating one of the best defenses in the NFL without Rob Gronkowski in the lineup is about as convincing a win as we could have asked for. Is 4-0 a realistic possibility? Based on what we saw in what was supposed to be the toughest match-up of the first four weeks, I’d say absolutely. Is Tom Brady’s job in jeopardy? Let’s not get carried away. If Jimmy G goes 4-0 and then we lose Brady’s first start in week five then we might have something to talk about in regards to a quarterback controversy, but as of right now that’s not a likely possibility. For now let’s just count on the second most handsome QB in the NFL to bridge the gap until the GOAT returns. He’s on the right track so far and I look for that continue in week two’s match-up against a depleted Dolphins defense at Gillette. Miami did manage to hold the Seahawks to just 12 points in week one but lost defensive lineman Earl Mitchell to injury, forcing them to re-sign Chris Jones just two weeks after cutting him. Jordan Phillips will likely replace Mitchell in the starting lineup. Miami’s defensive line will still be explosive, but Jimmy G appears to have the presence of mind and the quick release to deal with heavy pressure. Combine that with a mediocre secondary and a possible return for Gronk, and we should be looking at 2-0 to start the season.